Staybridge Suites at Hamilton Place Mall has an inviting staff and top-quality amenities at a great location. The airport (CHA) is two miles away, and Enterprise South and the new Volkswagen plant are three miles from our extended stay hotel.Our Chattanooga hotel puts corporate travelers where new business thrives outside the shadow of Lookout Mountain. Business guests have easy access to Volkswagen, McKee Bakery, US Xpress, Federal Express and Shaw Industries. Our business amenities include 1,188 sq. ft. of meeting space, free high-speed Internet access and a 24-hour Business Center. Chattanooga is famous for the gardens of Rock City, the caves of Ruby Falls and the beautiful views from Lookout Mountain, and our guests will find it easy to visit the many attractions in Chattanooga. 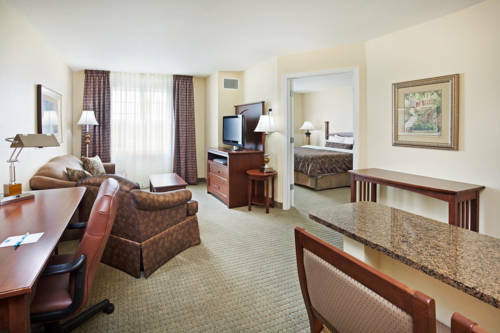 For corporate housing or a relocating family, our Chattanooga hotel's amenities will exceed your expectations. You can start each day with a free breakfast, or prepare meals in your suite's fully equipped kitchen. A free laundry facility, a 24-hour Fitness Center, an indoor pool with an outdoor courtyard with barbecue grills are just a taste of the amenities you'll enjoy at your home away from home.Pet Policy: Maximum two pets per room allowed with nonrefundable fee: 35USD per pet for one to three nights; 75USD for four to seven nights; 150USD for eight or more nights. 25 pound weight limit per pet. Unattended pets must be crated. Meeting Room #1: This is half of our larger meeting room, which can be separated for breakout sessions or combined for a larger capacity. Council Fire Golf Club18 hole course features 6,999 yards of golf from the longest tees for a par of 72. The course rating is 73.8 and it has a slope rating of 137. Hamilton Place MallOne of Chattanooga's most popular visitation sites is Hamilton Place. Over 16 million shoppers a year have enjoyed the Hamilton Place area which includes Hamilton Place, Hamilton Corner, Hamilton Crossing, The Terrace and The Shoppes. Creative Discovery MuseumCreative Discovery Museum is recognized as one of the premier hands-on childrens museums in the region. Gather the young and young-at-heart and make plans now to visit us at Creative Discovery Museum. Whether it's for a couple of hours or a whole day. Lake Winnepesaukah Amusement parkWith eighty five years of history and excitement, Lake Winnepesaukah is dedicated to providing a family fun atmosphere thats close to home and at a price the average family can afford.